We had another fun road trip up to San Antonio this past weekend. 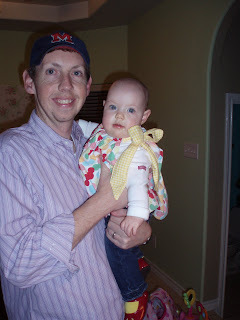 Avery and I hung out with Omie and Opa while Todd headed up to Bastrop for another adventure race. 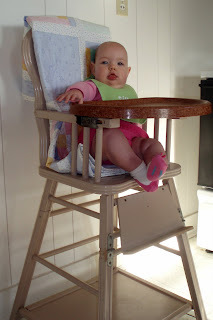 Here is Avery testing out the vintage high chair that was used for me as a baby. 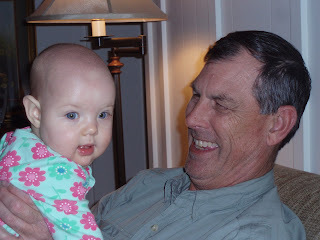 Avery and Opa had some good bonding time. 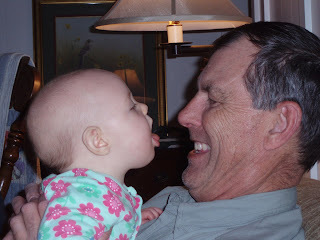 Especially when Avery was trying to eat Opa's nose. We spent a fun day with Kelly, Doug, and Luke on Sunday, but once again I forgot to pull the camera out. We made it back to Laredo safe and sound. Todd was tired, but he recovered quickly from his race. Avery has become a good traveler lately. 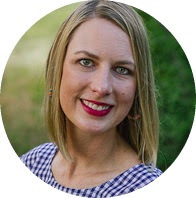 You can find the instructions to make a top like Avery's here. This one was made from one of my old skirts. It's great to practice sewing on free fabric!